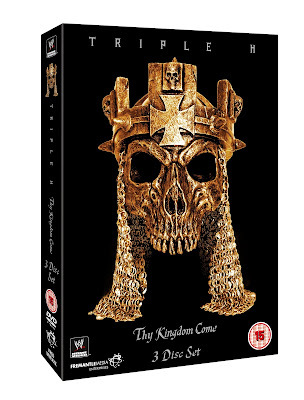 WWE's Triple H: Thy Kingdom Come is out now on DVD and Blu-Ray, available from www.wwedvd.co.uk, currently priced at £19.99 for DVD and £22.99 for Blu-Ray. The three disc set features a documentary looking back at the career of The Game, as well as number of added matches from 1994-2009 (with the Blu-Ray bringing things up to 2013). The set features matches against a number of top WCW, WWF and WWE opponents including Shawn Michaels, Chris Jericho, The Undertaker, Ricky Steamboat and The Rock. For me, it feels like WWE were hoping that Triple H: Thy Kingdom Come would sell solely on the strength of it's documentary feature. Admittedly the documentary is a strong one, covering Triple H's career as you'd expect it to, starting with his days in WCW at Terra Ryzing and Jean Paul-Levesque before powering through material on D-Generation X, Evolution and The Games' many title runs. Whilst many of the interviews included on the set are informative, backing up knowledge that will be common for the majority of wrestling fans, the strongest interview contained here is one with Vince McMahon, as is usually the way when the Chairman appears on a DVD documentary. Vince talks candidly about his relationship with The Game, including a fascinating insight into the brain of WWE's mastermind, as he talks about the MSG incident, as well the developing relationship between Triple H and Vince's daughter Stephanie. The only name really missing to make this set feel a little more complete for me would be Chyna, especially during the section about the Ninth Wonder of the World herself, where it feels very weird not to see an appearance, although Chyna's current adult film career probably has something to do with that. Some have called for some more negative thoughts on Triple H, maybe from someone like Bret Hart, but on a set that celebrates The Cerebral Assassins career, especially considering his position in WWE, that was never going to happen. As strong as the documentary is, the matches selected for the following two discs leave a lot to be desired. Whilst matches with Ricky Steamboat and Dude Love are relevant for a complete look at Paul Levesque, showcasing the characters of Jean-Paul Levesque and Hunter Hearst Helmsley, neither really do the job of showing what either character was capable at their best. The standout from the set is a superb Iron Man Match with The Rock from Judgment Day, complete with all the tropes you'd expect from an Attitude Era main event, with some strong storytelling throughout. Closing the first disc is a decent No Disqualification match with Kurt Angle, whilst the story here is simple and effective, the focus is clearly on Stephanie McMahon-Helmsley and that makes this feel a little out of place here. The final disc kicks off with Triple H teaming with Steve Austin (known as The Power Trip) against The Undertaker and Kane. It's pretty good match, but feels like it was only included to squeeze in a match involving three important players in Triple H's career onto the set, when The Game has had better singles matches with each. A pair of Last Man Standing bouts, one with Shawn Michaels and one with Randy Orton are the stand outs on this disc for me, with the Michaels match in particular standing out for a superb display by HBK and a compelling story. Elsewhere, this disc is pretty throwaway, with forgettable matches with Ric Flair, Jeff Hardy and Chris Jericho, all not living up to expectations, and again Triple H has had much better matches with all three of those guys, with the Jeff Hardy one seemingly only being included to show that Triple H loses once in a while. Ending the set with the Jericho bout, that had very little consequence, and happened way back in 2009, leaves this one feeling rather flat, with WWE's decision to leave the match with Brock Lesnar from this years Wrestlemania, leaving the DVD with no definitive ending. For me, this three disc set feels like WWE thinking that their main course is so good, that they shouldn't really bother with a desert. If your after a good documentary, or are a fan of The Game then this set is definitely for you, if your after some strong in ring action, then download the bouts with The Rock, Shawn Michaels, Randy Orton and possibly Kurt Angle from itunes, and leave the rest on the side of the plate.